300X Non-Surge Check Valve closes automatically in case of prevent mediums back-flow. The Non-Surge Check Valve allows flow when inlet pressure in higher than the outlet pressure. 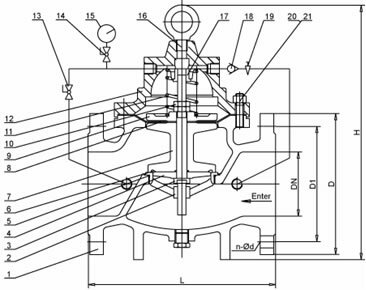 The valve has the principal of slow-open, quick-close and slow-close into one to prevent water hammering when the pump starts or closes. Non-Surge Check Valve opens and closes at controlled speed to ensure smooth flow. Used on the pump outlet of a water supply system to prevent mediums back-flow, water hammer and water shock. It has three functions as an electric valve, check valve and water hammer remover. 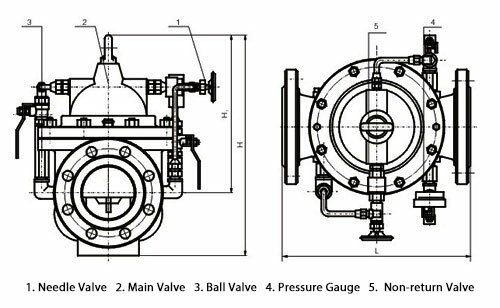 It is capable of improving the safety and reliability of the water supply system effectively through integrating the technical principle of slow-open, speed valve, slow-close, and removing water hammer and preventing of both pump-starting and pump-stopping water hammer. The gate can carry out open-close automatically upon the operation rules of the water pump just by operating the pump to open or close electrically. Hydraulic Check Valves features by the big flow and small pressure loss, reliable sealing performance, easy installation, debugging and maintenance and long duration. Copyright © 2015 Shanghai Remy Valve MFG. Co., Ltd. All rights reserved.